Slow-scan Polaroid taken at Goldstone tracking station reveals far more detail than publicly broadcast TV during Apollo 11 moonwalk. Search is underway to locate old Apollo tapes and freshen them up with new digital technologies. A screeningof long-lost tapes from the Apollo 11 mission ? including footage of NeilArmstrong's iconic descent from the lunar module to the surface of the moon ?will take place in Australia next week, according to news reports. This will bethe first time the tapes are screened in public, the Agence France-Presse newsservice reported. The showingwill be part of the Australian Geographic Society Awards Oct. 6 in Sydney. Apollo 11 lunar module pilot Buzz Aldrin isexpected to be the guest of honor at the event. A set of tapesof the historic 1969 moonwalk was thought to have been either reusedyears ago ? erasing the original images in the process ? or lost somewhere inNASA's archives. The spaceagency embarked on a full-scale search and found them, but in badly damagedcondition. Workers meticulously labored frame by frame to give theblack-and-white tapes a digital makeover. 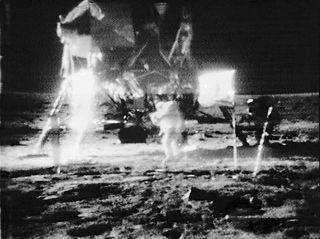 The restoredfootage runs for a few minutes and provides some of the best images of man's first steps on the moon, Australian astronomer John Sarkissian told AFP. Sarkissian,who was a member of the restoration project, is an operations scientist at theCommonwealth Scientific and Industrial Research Organization's Parkes RadioObservatory in Parkes, Australia. He said thefootage, which was recorded in Australia, shows the first few minutes of Armstrong's descent. NASA was relyingon the Goldstone, Calif., station signal, "which had its settings wrong,"Sarkissian told AFP, "but in the signals being received by the Australianstations you can actually see Armstrong. "Inwhat people have seen before, you can barely see Armstrong at all. You can seesomething black ? that was his leg." The video formspart of a highlights reel of the now-digitized moonwalk footage. ?Because Aldrin, who followedArmstrong onto the lunar surface on July 20, 1969, plans to attend the event,the screening holds a particular poignancy. "Whenwe heard Buzz was going to be the guest of honor, we thought: What a greatopportunity," Sarkissian said.